Recently as part of a project we did some testing of a Bluetooth antenna we had designed for a solution, the results were quite interesting and so we thought we would share them. We had already done lots of testing in our own labs but we wanted to ensure our device was as good as we thought it was. 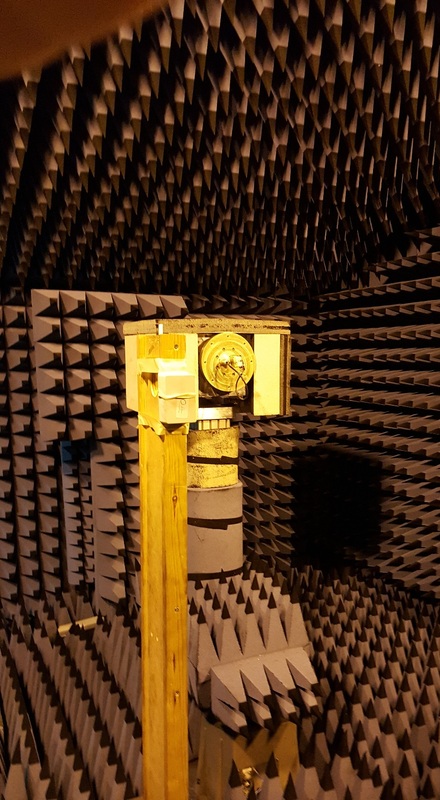 To do the testing we enlisted the help of our friends at the University of Kent and used their anechoic chamber. The product we had developed is a Bluetooth Smart device so the testing concentrated on the advertising and allowed us to see the actual transmitted power on each of the advertising channels. Before we tested our own design we thought it would be useful to test a commercial module so that we had a benchmark to compare our design against, we choose a freely available Bluetooth Smart module (we don't think it is fair to tell you which one but let's just say it was from a very major player in the Bluetooth market). We set the module to transmit on full power and put it in the chamber. On the above plot you can see the 3 peaks for the advertising channels, the first peak at -53.93dBm, the second peak at -55.61dBm and the third peak at -59.95dBm. What this means in none 'teccy' speak is that the transmitted power on the third channel is only one quarter of the power of that on the first channel. It is likely that this is caused by the tuning of the antenna on the module, it seems the antenna is tuned for the lower frequencies so that there is a better IC to antenna match at the low end and a poorer match at the high end. It just goes to show even the big boys can sometimes get it wrong!! Armed with this information we put our design in the chamber and repeated the test. 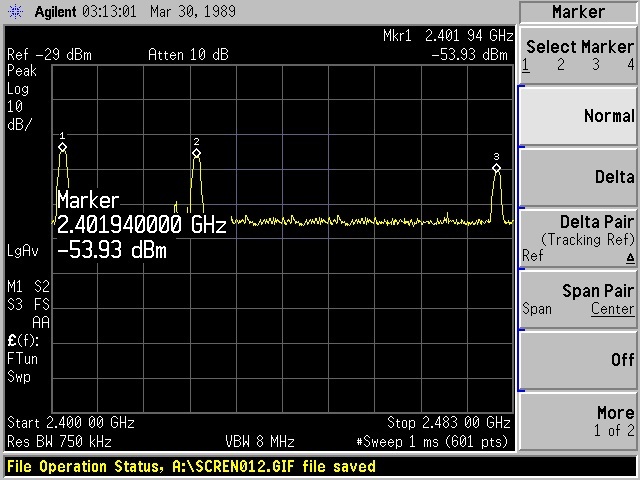 What we can see here is that the transmitted power on each of the 3 channels is more or less the same from which we can conclude that the antenna is ideally tuned providing a good match between IC and antenna across the full frequency spectrum. What we see after a great day at the University of Kent is that design and tuning of an antenna is critical when it comes to getting the best performance out of a Bluetooth Smart device. We were all very proud to see that our hard work had paid off with a device that performs extremely well even when compared to other commercial products available on the market today. For any product a good user experience is very important and the antenna performance is a critical component for achieving this. Poor antenna performance can certainly degrade any product.